Oops, I did it again. I couldn't resist yet another off-beat Halloween costume for my 1 1/2-year-old daughter. 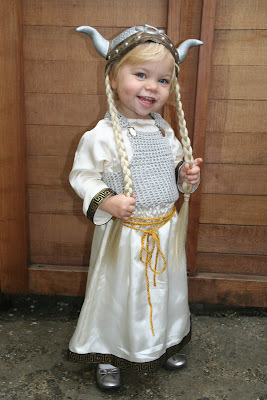 She already had the viking helmet, which she often wore around the house. I merely switched out the stumpy red braids for the long, blonde locks that I got from a beauty store. The gown was taken from a angel costume pattern which I trimmed with the brocade ribbon. The belt is a gold braided belt, wrapped multiple times. The trickiest element was the "chain mail" crocheted vest. I am a bit amateur when it comes to making knit or crochet garments without a pattern. Needless to say, it took more than a couple tries to get it right. The silver metallic yarn worked perfectly, although it wasn't the easiest to crochet. I fastened the straps with suspender clasps for easy on and off action. Although she probably had no clue what she was dressed as, she really enjoyed wearing the costume and we had such a great time trick-or-treating.